There are several varieties of Pond Lily (often called Water Lily) in British Columbia on ponds and in quiet corners of larger lakes. Yellow Pond Lilies are floating perennial herbs that are held in place by rhizomes on the lake bottom. Long thin stems allow the flat leaves to reach the surface. There they float in masses to gather sunlight and reproduce. When kept in check by natural conditions, pests and predators, they are lovely. But on Cranberry Lake in Powell River they are a problem. As the water flow has decreased, the lilies have proliferated. Remediation isn't easy or cheap, but homeowners are working to see their lake restored to it's original beauty. Wayne and I were paddling our kayak on Nanton Lake at the end of summer. The water was so clear that you could see this Pond-Lily plant all the way down to where its stems reached lake bottom under which their large rhizomes anchor them down and extract nutrients. References: Plants of Coastal British Columbia by Jim Pojar and Andy MacKinnon (Lone Pine Publishing, 1994) and E-Flora BC: Electronic Atlas of the Flora of British Columbia. I grow kale in my floating garden. It’s a long lasting, hardy relative of cabbage that’s easy to grow and tasty to eat. I plant seeds directly in the soil spring, and the plants produce through winter unprotected in our mild Coastal BC climate. My favourite is Curly Kale. That’s the variety you find frequently in the grocery stores. Early in the season, the leaves are relatively flat, but come cold weather they get curly and thicker. Just pick the leaves you need. It’s like having a root cellar right in your garden. The following spring, the plants flower and form seed heads. I pick some of the beautiful yellow blossoms for table bouquets. A tasty side dish on a cool evening is sweet potato and kale stir-fry. It’s quick and easy, and you don’t have to grow the ingredients for yourself. Just check your produce aisle. Here’s a recipe for two hungry people. Peel and dice one sweet potato. Wash and chop about three cups of fresh curly kale (it will reduce in volume as it cooks). Chop half a small onion and a clove of garlic. Sauté the onion and garlic in butter. Real butter gives it a special flavour. I always keep individual measured and wrapped pieces in my freezer for this purpose. When the onion is limp, remove it from the pan, and add a little more butter. Put the diced sweet potato in the pan and cook on low until the bottom is lightly browned. Turn and brown the other side. When tender, add the cooked onion and garlic, and kale. Stir until the kale has warmed and wilted slightly, but still green and a bit crunchy. Salt to taste. It takes about half an hour to cook (mainly to slowly brown the sweet potato), but well worth the extra time to prepare. 55-gallon plastic barrels for extra flotation. Last summer we worked hard on repairs and renovations when the weather was warm and conditions calm. One major task was to add barrels for extra flotation under the cedar logs in the back corner of the cabin. When we added a bathroom for our composting toilet that made extra weight on the float logs. Pull line to get the barrel under the cabin. We don’t want the logs to get saturated, so they needed to an extra boost higher in the water. In addition to extra flotation, exposing the logs allows them to dry on top and become more buoyant themselves. As usual, our good friend John helped us. John sinking the first barrel at the edge of the float. There was just enough room to tuck two more barrels between the cedar float logs where they were needed. We already have quite a few 55-gallon barrels underneath. But the two new ones had to slip under and between their neighbours. John crawled under the cabin on the float logs. Step one was to tie twine through a hole drilled in the top rim. This hole couldn't penetrate the barrel, which has to remain airtight. The twine was then tied to a length of floating rope. When installation was complete, the twine would be sacrificed to save the floating rope. Wayne pushed the submerged barrel under. Step two was for Wayne to use a pike pole to feed the floating rope down under the logs and existing barrels so it would ascend where John was waiting crouched underneath the cabin deck. John used a wire coat hanger hook to grab the yellow rope as it came into view. This rope would allow John to pull the barrel into place. John using the pull line to maneuver the barrel. The barrel on its way under the float logs. Wayne used the 12-foot pole to propel the barrel down as far as it would reach and in John’s direction. The push and pull process turned the barrel from its vertical sinking position to the horizontal position needed to snug up between the cedar logs. Wayne manning the compressor up on the deck. Step five was to inflate the barrel. John has a compressor with a hose and wand extension he devised specifically for pumping air into barrels. The narrow slits between float logs make this procedure difficult, forcing many cabin owners have to hire scuba divers for this step. John used a wand to fill the barrel up with air. Wayne manned the compressor while John held the wand into the barrel’s open lower hole. After a few bursts, he stopped to make sure the barrel was in position. Then the compressor ran to push air in and all the water out. Here’s a video of the process from a few years ago. John checking the barrel's position. Once the first barrel was done, it was on to number two. The float log at the back corner rose just above the lake level. Then over the next month, as it dried, it rose even higher. Job well done. Wayne and I usually go quad riding together, but this time I opted to stay with the barge to get some sun and hike the lower roads. The reason, Wayne and our good friend John were going to ride in steep locations at Chip North on Powell Lake and fresh cut areas with steep slopes make me uncomfortable. The easiest place on Powell Lake to load quads is Kinsman Beach near the Shinglemill Marina. We land the barge on the shore and lower our ramps. Except on holidays or hot summer afternoons, it isn't busy. John rides with his big Lab Bro in a cushioned aft box. Bro can sit or lie down, but if there's a bear he's up and howling like an emergency siren. Chip (Chippewa) North is a fairly new logging area with main roads wide enough for the big off-highway logging trucks called Fat Trucks. The barge ramp is in excellent condition. At the time of this post, the dock is usable but has a sunken spot in the middle. One advantage of new logging roads is that the sides are open, affording great views. Here's Powell Lake from the road that switchbacks and climbs up the steep slope towards the distant ridge. 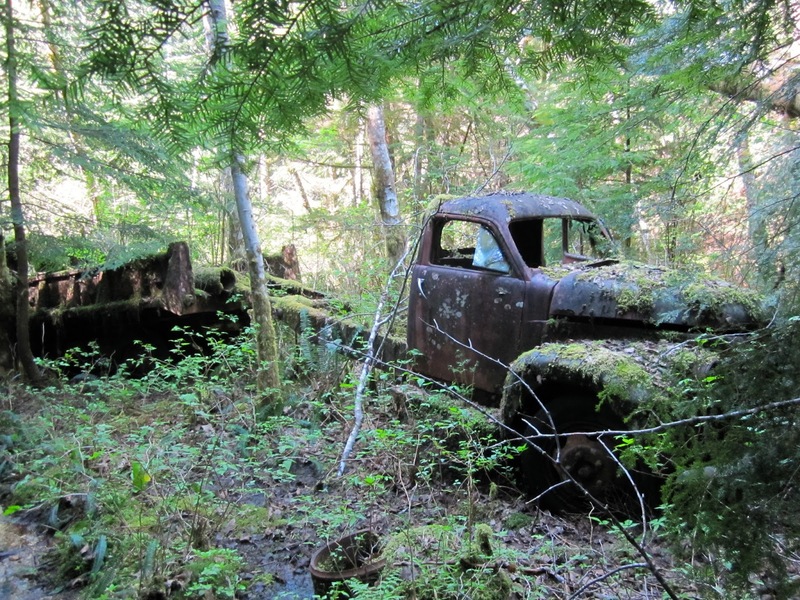 On the upper logging road near a stream, they cleared a blockage. From there, an old logging road continues west following the stream towards Theodosia Inlet. 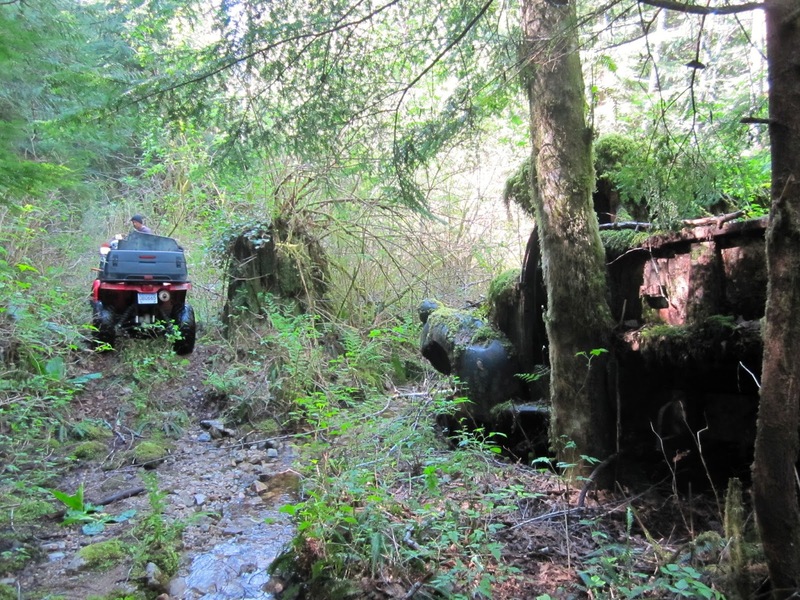 With John in the lead, they were able to continue up the partially overgrown road. John loves to check out old equipment. Rather than continue, they reversed course. While they rode, I relaxed and read. My only regret was not seeing the old equipment. 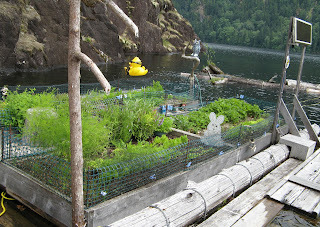 My garden has raised beds on a cedar log float. Each year my floating garden has different stars. This year it's my root crops. My carrots are larger than usual. My beets and onions are doing great as well. I plant my seeds directly in the soil at Easter. This is after the last freeze, but the weather can still be rainy and cool. This year we had a warm spring, so everything was about two weeks early. This year I think my root crops are better because I really thinned them at the seedling stage. In the past, too many plants struggled for room. Now they all have more personal space, and the result is bigger, more flavourful produce. This year I planted beets again. Because my garden is small, I rotate the crops and change things a little each year. Beets are easy to plant because the big seeds are easy to sow. When it came time to do the thinning, I was careful and relocated crowded seedlings to bare spots. Now I can make lots of fresh pickled beets. They're really easy. Remove the tops about one inch above the root. Thoroughly wash the root, but do not break the skin. Place beets in a pot and cover with water. Bring to a boil then reduce to medium for 30-45 minutes. Rinse in cold water and remove skins (they slip right off). Slice the beets and place in a covered dish. Pour Marukan Seasoned Rice Vinegar to cover beet slices. Add about 1 teaspoon sugar and stir. Stillwater rail line trestle in Nanton Lake. 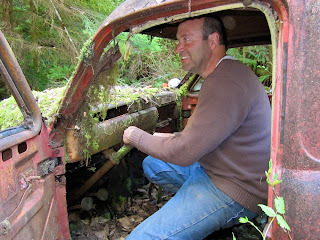 Last week I read a post about historic railroad logging in the Powell River region on the Powell River Daily News blog. Little did I know that I would be seeing firsthand some of the remnants in the backcountry. A separate row of pilings supported a loading car. We met our good friends Dave and Marg to go kayaking and camping at Nanton Lake. Wayne and I waited until the Goat Lake Main logging road opened for public access at 6:00 pm to drive to the Nanton Lake Forest Campground. That would be our kayaking headquarters to explore Nanton and nearby Horseshoe Lake. On the way back to camp, Dave took us by the southwest corner of the lake. 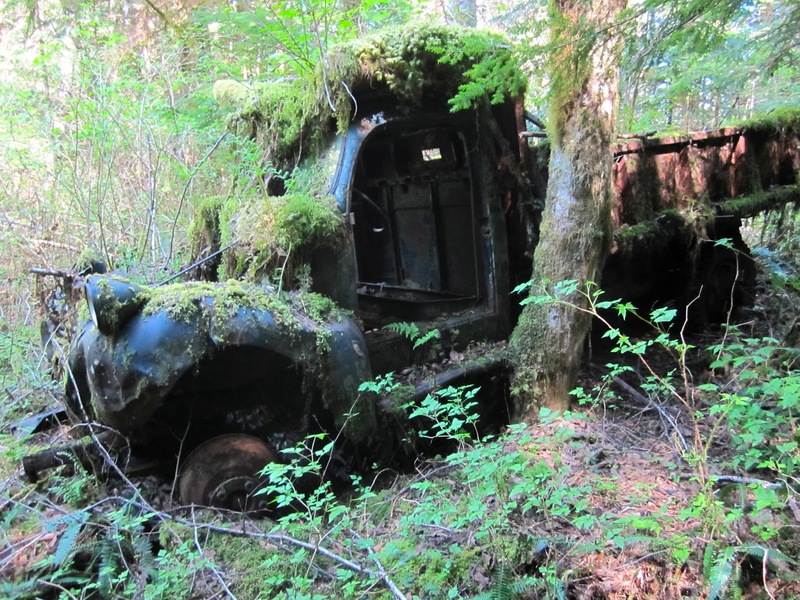 There he showed us the remains of a spur on the The Stillwater Eagle and Northern rail line that carried logs from the backcountry to the ocean from the turn of the 20th Century until 1954 when logging trucks took over. 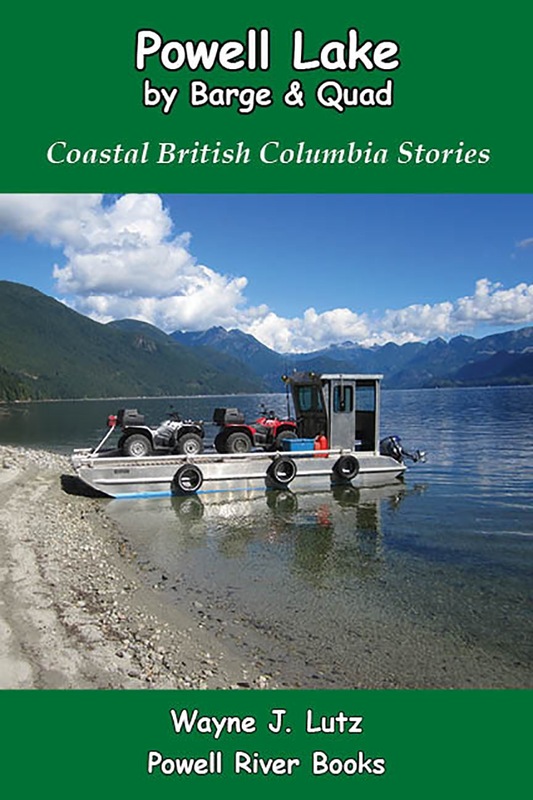 Click here to read the whole story at the Powell River Daily News site. Axle from rail car used to load the logging train. Because the lake level was so low this late in the summer, we could see where the pilings crossed the edge of the lake. The axle from the other side. Next to the pilings for the rail line, there was a second row that held a loading car that removed the cut logs from the lake and took them up to the waiting railway cars for transport. Collapsed beams from the loading car support structure. On one exposed set of pilings, an old axle was rusting away. At higher water levels, it would be visible. More of the support structure. Underwater there were lots of other logs, board, braces and equipment peaking out from under the clear surface. Staying underwater helps preserve the wood and metal components. I love finding historical evidence in the backcountry. There's so much to learn about how Powell River was founded, and how it developed over time. We went on a kayak day trip paddling on Nanton Lake last week with our good friends Dave and Marg. They were trying out their new sit on top Big Tuna double Jackson Kayak. Wayne and I were in our older Current Designs double we lovingly call the Big Yellow Banana. Nanton is one of a chain of lakes in the Powell River area. 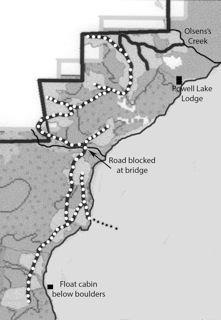 It links to nearby Horseshoe Lake by a wide river, and is part of the Powell River Canoe Forest Route. Osprey nest on left snag reflecting in the calm waters of Nanton Lake. We paddled around the south shoreline on our way to Horseshoe. In a side bay, there's small island. When they dammed Horseshoe Lake to raise the water level, trees died leaving tall snags. On top of one of the snags is an active osprey nest. The bundle of sticks at the top makes it look like a giant mushroom. The birds flew off as we paddled by, but remained in the area. That probably meant there were young birds still in the nest. We stopped at a beach on Horseshoe Lake for a snack break. Western Forest Products, a local logging company, corralled many of the floating logs that caused huge log jams on the lake, but as you can see, there are plenty more that will start floating after the winter rains raise the water level. 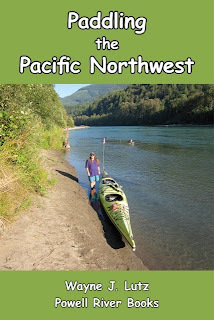 Available Online: "Paddling the Pacific Northwest"
Our Cole’s bookstore is very supportive of local authors. 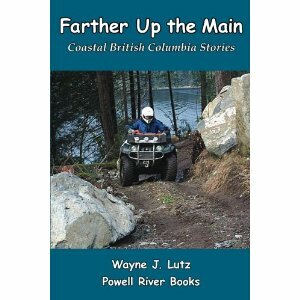 Wayne's had all of his Coastal BC Stories books on their shelves since the first in 2005. Lately, there are more books by local authors available than ever before. That’s due to a combination of supportive booksellers, and the ability of little known authors to self-publish their own works. On a recent trip into Cole’s I found The Donkey Puncher’s Daughter: Folk Tales of a West Coast Childhood (Works Publishing, 2014) by Kim Allen. What caught my eye even more than the title was the image of two young children in a black and white photo standing on a rocky shore. The girl looked a bit like me at that age, with a bobbed haircut and a big smile. 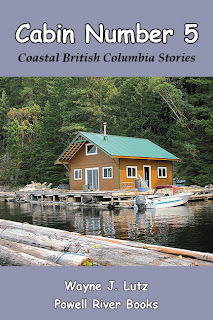 I would have loved growing up here in Coastal BC, but it was not to be. But at least I can read about what it was like. Steam donkey on Museum Main, Powell Lake BC. Kim Allen grew up in Powell River. 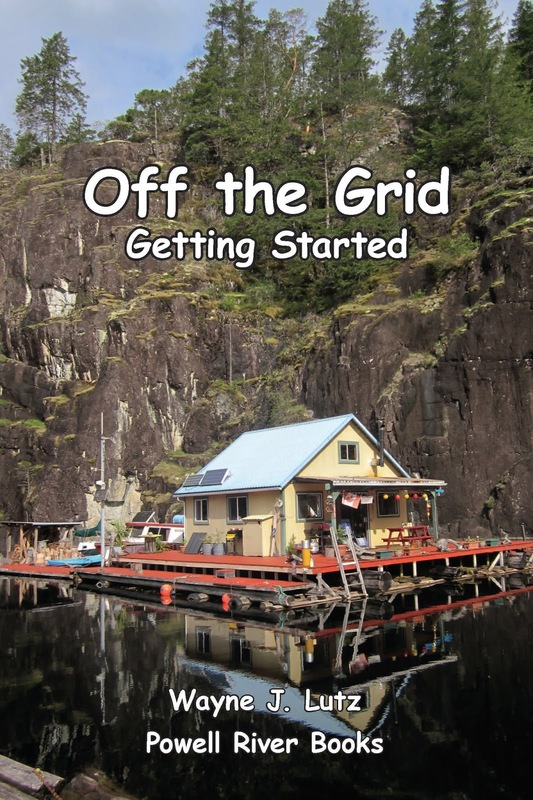 She wanted to capture and share what life was like when her mother grew up in logging camps to the north around Desolation Sound. The book was a way to record her family's history through the tales her mother told over the years. I can relate to that. I remember when Dad put me to bed I would always say, “Tell me a story.” My mom was a good storyteller based on books she read to the kids in school, but it was my dad that had the best stories. His were about camping, hiking, fishing, and growing up in Compton, California, (where we still lived) before it was swallowed up to become a Los Angeles suburb. My favourite story for some reason was when Dad was caught in an abandoned shack with a rattlesnake. It had nature, adventure, and suspense, all elements of a good tale. I must have made him tell it to me hundreds, if not thousands, of times. Logs in a boom on Powell Lake. 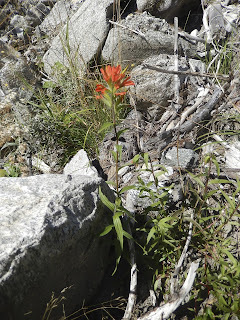 I've been looking for Indian Paintbrush, a flower common to woods, meadows, open slopes, and roadsides, for a long time. I remember seeing it as a kid on camping trips with my parents, but so far this is the first sighting here near our Powell Lake home. I found my first specimen in the middle of a dry, rocky streambed. 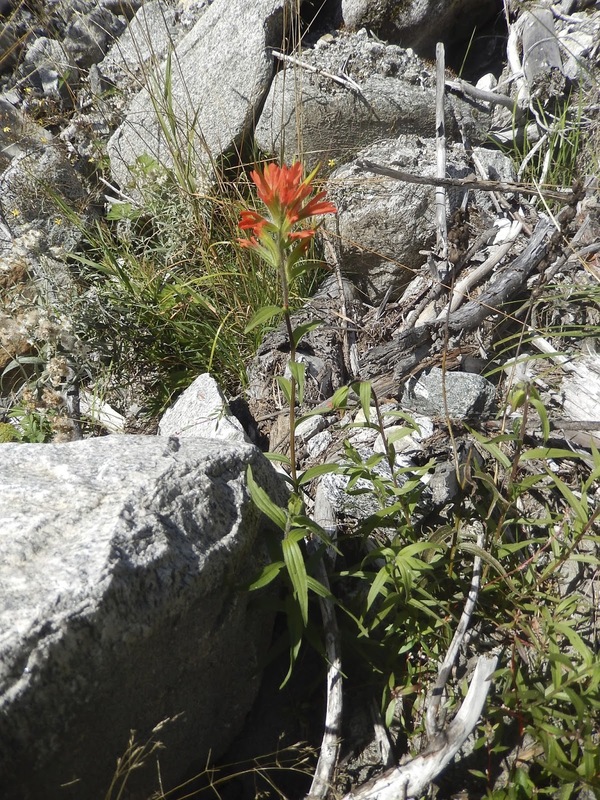 Also known as Common Red Paintbrush (Castilleja miniata), it is the most common species in the region. They grow with erect stems up to 80 centimetres tall with narrow pointed leaves. The flowers (future seed bodies) are actually small and beak-like, hidden and outshined by the clusters of bright red pointed bracts surrounding them. Indian Paintbrush blooms from late spring to mid-summer. While the most common colour is red, they also come in rose, yellow, orange, and white based on the species. It is partially parasitic. Paintbrush plants use their roots to drill into adjacent roots to derive a portion of their water and nutrients. Between the mackerel sky foretelling the impending storm, and the clearing clouds after it was done, there was a week's worth of rain here in Powell River, BC. The rain was welcome, but the associated wind wasn't either in town or here up the lake. Our storms come from the southeast, but the mountains surrounding Powell Lake force the wind to change direction. Wind, waves, and clouds are forced north through First Narrows. Two weeks ago, I shared about the garter snakes that we see around our float cabin up here on Powell Lake. There are two varieties that visit us. One is the Common Garter Snake. The other is the Wandering Garter Snake. I think this is the Wandering kind.